Dems caught rigging election for Hillary? Is this a nomination… or a coronation? Party insiders are openly complaining that Democratic Party chair (and longtime Hillary Clinton pal) Debbie Wasserman Schultz is breaking rules left and right in a blatant attempt to hand Clinton the Democratic presidential nomination. “It’s bad for Democrats and bad for the country, but she’s apparently decided that it’s good for her own career to hitch her wagon to Hillary Clinton,” Tim Canova, a professor of law and public finance at Nova Southeastern University, complained in a recent interview. Others have been even more blunt. “She’s acting as a shill for Hillary Clinton, doing everything in her power to ensure that no one will effectively challenge Hillary’s coronation as the nominee,” attorney and activist Miles Mogulescu wrote in a Huffington Post blog post demanding that the party fire Wasserman Schultz. The impartiality of Wasserman Schultz has always been in question among Democrats. She was co-chair of Clinton’s failed 2008 bid for the presidency. Now, as chair of the entire party, she appears to be pulling every string she can to rig the nomination for her old friend. For example, she moved to quickly cripple the Bernie Sanders campaign when a worker was caught snooping in the party’s database of Clinton voters – not because he hacked his way in, but because the security firm Wasserman Schultz hired dropped the firewall. Sanders quickly fired the staffer, but Wasserman Schultz took great glee in rapidly handing down harsh punishment, cutting Sanders off from the party’s database, a move that effectively shut down his ability to contact potential supporters and raise money. David Axelrod, who helped Barack Obama defeat Clinton in 2008, said it looks like the party “is putting finger on scale” for Hillary. When it comes to violations that help Clinton, however, Wasserman Schultz is much more forgiving. She did nothing when one of her own top officials – Henry R. Muñoz III, finance chair of the Democratic National Committee – was caught organizing a fundraiser for Clinton, which is a direct violation of party rules. But her biggest gift to the Clinton campaign has been the debates… or rather, lack of debates. Debates are often seen as high-risk, low-reward for candidates with as much frontrunner status as Clinton. So instead of the 26 debates held in 2008, Wasserman Schultz has scheduled just six. Even leaders of her own party have publicly demanded more, but Wasserman Schultz has been adamant that there will be just six. And, unlike the GOP debates that are breaking viewership records, Wasserman Schultz and the DNC seem to be trying to ensure that as few people see the Democratic contests as possible. She continues to schedule them for odd times – like just days before Christmas. The only worse possible scheduling would be holding a debate at the same time as the NFL playoffs… and that’s exactly when the next debate will take place, on Jan. 17. Critics say Clinton herself couldn’t have come up with a better schedule for her campaign. Despite all the help she’s getting from party headquarters, Clinton is having a tough time cracking 50 percent in Democratic polls. She hit 50 on the nose in the most recent CNN poll, and fell to 46 percent in a Rasmussen Reports poll taken just before Christmas. It’s clear the voters in her own party want another option – but it’s just as clear they won’t be allowed to have one. They are fascist like, Can’t the Democrats do better than a proven selfish liar who dresses like 1970’s Maude? Are we being Nudged to accept a collective system ???? In this Video the BLM sets fires and BURNS Cattle !!!!! These articles talk more about the BLM Setting Fires …..
Are all these People like the Hammonds being Shoved or Nudged ? There sure seems to be a Pattern across the USA on dedeveloping the Individual’s Liberties don’t you think ? Maybe the BLM is a Member of the Social and Behavioral Sciences Team ? IS THE INDIVIDUAL ARE BEING SHOVED OUT OF BUSINESS SO A COLLECTIVE CAN FORM !!!!!!!!!!!!!!!!! This from the article ; http://www.breitbart.com/big-government/2015/09/15/obama-issues-executive-order-government-use-behavioral-data/ ; “The program has already existed in an experimental form, but now Obama has formally established the federal “Social and Behavioral Sciences Team,” ordering them to to use psychology and experimental behavior data to make government more user-friendly” . You see I think its all about the Ideology of Overpopulation and these Ideologues who think they need to do something about it , indulge me please …..
Socialism and a Totalitarian communism is how they want to control the rate of human consumption now to save earth from overpopulation . It won’t work because we are smarter than they are, proven case. Their IQ is below 60. Oh I know, IRS the water making them act like monkeyswho are not part of this civilization. If we are so smart why was Obama elected for a seconf term.? I do not believe he was elected but put in by fraud. The BLM is just one of the Federal Agencys that Need to be ELIMINATED. Hillary is The Satanic Jezebel !!! This Was NOT What This Country Was Suppose to Resemble…. Thanks to Obama, America, Which was to Always be Just and Moral, A Nation TRULY UNDER THE ONE GOD, The Blessed Trinity !!! HAS BECOME A TRUE WHORE !!!!!!!!!!!!!!!!!!! !♥ ♥ Amen ♥ ♥ !!! ! HAPPEN IN THIS COUNTRY TOMORROW. BY OBAMA HJILLARY AND KERRY. WHY ARE THERE A BIG FEMA CAMP IN EVERY STATE, SOME MORE. COULD IT BE TO HOLD MUSLIMS LISTED AS REFUGES? WILL TELL US WHAT IS GOING ON ABOUT THE FEMA CAMP IN EAST KY.
FACTS, I VOTE FOR THE MOST QUALIFIED PERSON, NOT A PARTY. DONALD TRUMP IS THAT PERSON. COMRADES????? OBAMA HAS SAID HE WAS A MUSLIM. AND DEMAND THEY TAKE ACTION. ROUNDED UP AND PROSCUTED AS ASSITING THE KILLERS. THEM TO CARRY THEM WITH PLENTY OF AMMUNITION. THIS SHOULD BE DONE IMMEDIATELY. THIS MESS OUT IN 6. MUSLIM COMRADES NEXT YEAR TO STAY IN POWER ????? AND ONE 8 MILES OVER IN MEXICO? AN INVADING ARMY? WHERE IS THIS AMMUNITION AT TODAY? WHAT WOULD HAPPEN IF AN INVASION HAPPENS? WOULD THERE BE A NEW PRESIDENT? THE RADICAL MULIMS OUT OF CONTROL LAST YEAR? WAS THE SHIPMENT TO HELP THE RADICALS? WAKE UP AMERICA, YOU HAVE NOT SEEN ANYTHING YET. ONE TRAITOR? WAS OBAMA PROTECTING HIS COMRADES. WHITE, HIS DAD A NORTH AFRICA ARAB. PARTY THAT FREED THE SLAVES. OF WHITES DIED TO FREE THE SLAVES. DO YOU BELIEVE THAT THE DEMOCRATS STARTED THE KKK. THERE, COULD IT BE TO TRY AND STOP ISRAEL. COULD YOU DO WITH 260 THOUSAND OR MORE. THE SECOND ADMENDMENT AND NO LAW SURPRESS THAT. LET THEM KNOW HOW YOU FEEL. ARE YOU FOR AMERICA? OUR GOVERNMENT MAY DECIDE TO STOP ME. ADMINSTRATION IS BACKING A MUSLIM TAKE OVER HERE. OR INDEPENDENTS IF YOUR ANSWERS IS YES..
GREAT post Sir. Thank you for your service. Cap’n, it sure as hell shouldn’t be a surprise to any of us! I think 10 minutes after she announced she was running for the job, she won. Unfortunately she will be the next President, the same way obama got in, it’s all a farce thanks to the Collage Electoral crap. The American Peoples votes don’t mean a thing anymore it’s all a fix. God help us because she will be the female version of obama and possibly worse. Our employees in Congress don’t have the guts to oppose any of it, for fear of losing their parasitical positions! Have you ever heard of a run-on sentence? This country founded on principles? Hummmm???? I was on a visit to a reservation North east of Las Vegas and in a gift shop I saw a photo of a row of chiefs sitting down with a White guy with a rifle standing behind them. At first quick glance it looked like they ALL had rifles in hand as always in the olden days. After further inspection I noticed the Indian chiefs all had SMOKING PEACE PIPES. They were there to discuss Peace, but the guy in the back had a Rifle. The writing below the photo said something to the fact, TRUE NATIONAL TERRORISM! I realized they were right! The true terrorist came in and MASS KILLED all the original people in this land. 1,000’s of tribes killed off down to only 23 tribes left from Alaska, Canada, and all the way to the tip of south America are left. NO ONE teaches our young the truth about the slaughters. What would you do if today someone came in and started slaughtering the citizens of this country???????? Those that came in and followed the Churches edict to Slaughter them all, and to burn their writings as Satanic, and to CANNON THEIR LIBRARIES AND UNIVERSITIES TO THE GROUND LEAVING …NO…STONE ON TOP OF EACH OTHER. using their priests and monks as spys to spy-out who were educated and then send the soldiers in to slaughter whole villages, these were the true terrorist. Because of the last lost tribe which had come here and bled their bloodline all from north america to south america therefore creating CROSS-BREEDS. The locals KNEW they were part of this last lost tribe. When the spanish took this data back to the church, which was run from the top by the PURE-BLOODS, they sent out the edict to slaughter them all, that the sons of Ham could be enslaved, that all their writings were Satanic and to burn them all and to Cannon all Libraries and Universities to the ground. It was not because they wanted the land, it was because of who they were and what they knew. As those that are left, mixed with the whites, and the U.S. documentation shows that 72% of the U.S. population has to some degree American Indian, and the last tribe had mixed their bloodline into the local population of the original people,the American people too are still on the list for elimination as crossbreeds, and must be removed in their quest of CLEANSING OF THE BLOODLINE WORLD WIDE. This is the reason the war is being prepared to be fought here in the states, bringing in people who have been mind programmed by the best propagandist since world war one training them to hate Americans. They too are being USED to do the killings FOR THE PUREBLOODS. Pure-bloods wanting cleansing of the bloodline worldwide, so creating wars by financing both sides to fight, manipulating both sides to fight, tricking both sides to fight, pushing both sides to fight, and wherever war breaks out anywhere in the world where they have created the trouble years ahead of time, then getting those they have mind programmed to kill off the crossbreeds. We saw it in Russia with the Bolshovick war, going city to city killing all the crossbreeds. We saw it in Germany tricking and using the Germans to do their dirty work of Cleansing the bloodline while they sat back and looked religious and innocent. Recall the Hootoos and Tootsies war in Africa some years back where police were given lists of names to hunt and slaughter those that had specific bloodlines? Recall the wars in Guatamalla, Belize, and El Salvador where soldiers went house to house with macheties killing people. I spoke with a man who said as a child he would walk out the front door to go to school and a head would be lying by the front door. At first years he would be afraid then after he got used to the killings, he would just kick aside the head and go on. Recall the war in the Phillipines in the early 1900’s where all the people were killed down to the age of 9 where the American soldiers were used to do the slaughtering. Recall also around that time where the British soldiers were used to slaughter the whole island of New Zealand. . Always using someone else to do the slaughtering to eliminate the crossbreeds, and always using some so called excuse trumped up for the slaughtering. You see the trumped up ideas of fighting among the colors here in the united states so they will fight each other and under the cover of war more than 72% of the U.S. Population has been planned to be eliminated by the lists. Recall the questions on the last Census where they are asking race and religion?? when they are ready to start eliminations they just pull up the computer lists and pass them out to the soldiers that have come in from other countries to be used for the eliminations since they have no loyalty to the people of this country. We have been had guys! We have been duped to thinking we are safe. But we are sitting ducks. People I know live in the High Desert in Oregon have told me for years since the early 1990’s that they have brought in tanks and Hummers and dug pits and greased them down on the surface so the sand won’t eat the metal and paint, and then buried them there. You can go in with metal detectors and find them there. Our forests are bring burned off constantly being re-set there again and again. Our ranches and farms are being burned off constantly. Destroying our forests so we won’t have lumber to rebuild, killing off cattle and horses so we won’t have any way to travel when they destroy our electric grids. So we won’t have meat to eat to feed our people. Vegetables to feed our people. Get real people, these fires are being set on purpose here in the states as well as Australia. I have followed them for more than 18 years coming from the north east downward. Now they are being arrested 49 at a time some years back, that were setting fires from Oregon all the way down to southern states such as Oklahoma and Texas, Many of them speaking Russian. before we attacked, we also are being slowly taken apart, wealth wise and our resources destroyed so we are weaker when the physical attacks come. We have been had, by Hillory and Bill as they broke down the military, and those that pull the puppet strings of Oboma. We have been had by their whole party that has plotted our demise and complete elimination. The Indians were always at war with each other before we got here. They had scalps of other tribes covering their clothing and lances. They stole from other tribes constantly. It was so bad that they brought their horses into their tee pees at night. They had slaves galore from other tribes all over the U.S. They carried a curved stone club called a “slave killer” they could throw at runaway slaves. Now, compare that to today for a change. I think when Debbie had her hair done they left the curlers’ on to long and burnt her ,what she had, brain. Boy, if these two aren’t beauty queens. Queen of liars and queen of manipulation. wasserman is merely the perfect “leader” of the dumocrats as she fits right in with them; a total lack of character and honesty with their false sense of entitlement and are always willing to take the lowest road available. I surely hope there are people out there checking into fraud going on in the voting system! Voter fraud is illegal and MUST NOT BE ALLOWED! I can’t believe how crooked the DNC is, something should be done about that! There is nothing ‘fair & square’ about the DNC! Why can’t the/some law come forward to put a stop to this? Somebody needs to wipe that stupid smile off your face. She’s a liar and she is responsible for the deaths of many people. And everytime it comes up she laughs. I can’t wait till someone actually just reaches up and slap her face! Wasserman/Schultz is as guilty of criminal activities as Hitlary. Maybe if we ever get this country back from the criminals we can arrange them to be in connecting cells. They are to of the biggest liars on the planet. No kidding. They’ve been trying to sell Hillary since Bill left office. The ruling Democrats can’t get America to buy her on her own merits (sic), so now they’re making sure no one else gets a chance. Unfortunately, her mind matches her wardrobe. Not 1970’s to unreal for that, 1960’s. NO THEY CAN’T BECAUSE THERE IS NONE THERE…..their actions speaks louder than words and only an idiot or a blind loyalist to the democratic party won’t see it. Very sad for America…..the demise of any empire is on their choice of their own leaders, at the hands of the uninformed. misinformed blind followers of the wrong party. This is how 0bama got elected twice. The dems have cheated before, And will continue to cheat.That’s the only way they can win. WHY IS IT that every time I see Debbie Wasserman Schultz I think of….THE BRIDE OF FRANKENSTEIN?! Let the Hillary backers do as they please. the more they try the more votes will be converted over to the only man who should and will be president in 2016 and that is Donald J. Trump…. Trump the only honest speaking person who is running for all the American people…For a better America pull the Trump lever in 2016…..
What you guys don’t get is that Trump is a Democrat that was sent to the Republican side to infiltrate, pretend to be a change over and cause trouble from the inside. Just as that Democrat came into the Tea Party from the Democrat party pretending to be a Tea Party person, and threw a brick through the door window of the Democrat office. Trump was sent to say what the SILENT majority are thinking and speak out loud about it. He adds his own spin to it to make it sound even more angry than the mass population actually is. He is mouthing off to get the GENERAL PUBLIC roused up to fight. Even though there is nothing to fight, the population is pushed to fight. Just as was done with the peasants in Russia originally and then again in Germany before the wars, the population was roused up to fight with nothing to fight so they turned on SOMEONE and fought. Now, there is a SUPPOSED ENEMY out there being pointed at to be the next VICTIM/ENEMY. The outcome will be shocking, the WHITE MAN will actually be the victim, since Obama has created his personally trained army quietly behind everyone’s backs. See United Nations Agenda 21 and see Senator DeWeese’s translation of Agenda 21 and all the things they have outlawed now. Speaking out can be outlawed too!!! Same groups behind each one of these mass exterminations, and will be the same groups (grandchildren of) on the United States coming soon to a neighborhood near you. Always a supposed enemy that people are pushed to look at, but the real enemy is quietly doing their damage from behind the scenes TO GET TWO GROUPS TO FIGHT, TRICKING THEM TO FIGHT, MOTIVATING THEM TO FIGHT, MANIPULATING THEM TO FIGHT, PUSHING THEM TO FIGHT FINANCING THEM TO FIGHT….and as the war breaks out, then quietly under the cover of war, moving in and killing off those that are on the list for elimination..
JUST AS THE WAR BETWEEN THE HOOTOO AND THE TOOTSIES IN AFRICA, THE POLICE WERE GIVEN LISTS OF NAMES TO ROUND UP AND KILL. They were of a specific bloodline or actually Cross breed bloodlines listed for elimination. We have been had guys, the world has been had! We will be used to do their dirty work for them while they look clean and religious while others do their killings for them. And this surprises ANYONE because……?????? Give them a chance to screw the top three contenders in the GOP and they will LEAP at the chance!!! Lovely 2 pigs together in slop. Both of them have one talent that they share” everytime they open their mouths, their heads disappear. Wasserman-Shultz a shill for Clinton are you kidding me, If she was any closer, she have to be pried out of Clintons a$$. The way they have staged this election for the Hill, Saunders and Webb both have called her out>Shultz. U g l y she has no alibi, she’s ugly, yes she is ugly. Organizing a event for Hill, a direct violation of party rules, where does the corruption stop with these 2? If Hillary gets elected I don’t know if our country can ever recover from Obama and then her. It will take decades to recover from all the damage Mr. Obama has done to the USA and the debt he has put her into. It is really sad just to think she could be our next president. LOOKS LIKE THE COMMUNIST PARTY HAS ALLREADY TAKEN OVER VIRGINIA. It looks like to many sponge heads there. no, just people that have the ability of independent THOUGHT! WILL THE DEMOCRATS EVER BECOME A CLEAN OR HONEST PARTY?? WHEN WILL THE LIES STOP? WHEN WILL THE OUT OF CONTROL GOVERNMENT STOP? IT IS NOW A THIRD WORLD COUNTRY ELECTION? ANOTHER BANAMA REPUBLIC? ARE WE JUST ANOTHER CHINA OR RUSSIA? I WOULD WANT TO SAY “NO”…………..BUT FROM THE LOOKS OF IT……WE REALLY ARE! It is NOT in their make up. They don’t know how. (brain dead). Just look at the vote counting in 2012, some states showed 100% Obama. That is not possible. Dems have been in control of the polls too long. I am not a republican but will vote for whoever runs against hilery. A lot of votes are wasted on independents. Good news, my Bulldog is running!!! Even HE will e better than hitlery!! Chet, the out of control Government will never stop until “We the Real American People” make ourselves heard. The political parasites in Washington could care less about the American People, all they care about is keeping their lifetime pensions, free medical and what ever else they can get for nothing, they all need to be voted out. As the ol’e saying goes “United We Stand – Divided We Fall” and the traitor in the Oval Office has done a great job in dividing us, so until we let them know we are sick and tired of their crap, it won’t get any better! Our voting polls need more protection than our borders, stop the illegals from voting and by all means do away with the Collage Electoral bullsh*t which is nothing but a fix for who pays them the most!! The time has come to elect a non political American person as our next President, someone who will not be influenced by the crooked liars and has the American People’s welfare as their main agenda! That is what the commieonazicrat party, ska democrat party, wants along with all of our guns so that we cannot defend ourselves against them. When they ditch H Clinton and support Burney Sanders. If he was not pro-choice he would look great to me. THE COMMUNIST ENDORSED PARTY IS WELL EMBRACED BY THE PAID, BIASED, MAINSTREAM MEDIA. THEY ARE VERY SUCCESSFUL IN BRAINWASHING THE IDIOT VOTERS TO THE DEMISE OF AMERICA. Can anyone say CROOKS? The communist party at work. Immoral, no conscience, no character, no patriotism , need I say more. You forgot : Brain Dead. You mean the Clinton party, don’t you? And the Democrats complain about a potential BUSH dynasty?? Debbie Wasserman: Beside being an [email protected] you must not have any scruples defending the biggest Lire, cheat and non American’s (beside Barack Obama) in America. Beside that you look like something that just escaped from an insane asylum. More Political Corruption from the DEMON-RATS! The BUTCHER of BENGHAZI and EXTORTION 17 is :GUILTY of TREASON and MURDER! Time to hold her accountable Impeach Obama and the entire house of cards will collapse ! Could Not Agree More!..But..Too many are Deaf, Dumb, Blind, either LEGALLY OR ILLEGALLY..BOUGHT & PAID FOR..OR DUMBED DOWN..Plus..We have been INTENTIONALLY..TRANSFORMED, INFILTRATED, & INVADED..But..ALL FOR THE “GREATER GOOD”..Fact IS..IT’S FOR ONE GREATER GOOD..BUT NOT FOR ANY OF US..Only for the ELITISTS, THE GLOBALISTS, & You know, the Rest of the Worlds, DICTATORS, COMMUNIST RULERS, KINGS & QUEENS, & SOCIALISTS, THEY What Ever the CHOSE TO “CALL THEMSELVES” Or “FITS” Their DEFINITITION? ?They are ALL THE SAME..RULERS OVER THE OTHER CLASS..One Class…the Subservient AKA..SERVANTS, WORKING CLASS..One PARTY..2 Classes..this IS & HAS Been the PLAN SINCE THE PRIOR “CORONATION OF THE Greatest DIVIDER/LIAR/SPENDER/M..IN CHIEF”..it was all Planned Well In ADVANCE AS WAS ALL HIS “NEW FLEET” of VEHICLES & MODES OF ALL KINDS OF TRANSPORTATION”…all made Well Prior to “IT’S CORONATION”..& made IN CANADA..HUM..Now WHICH WAY DID “CANADA’S..GOV..JUST GO? ?”..Put it ALL Together, with Europe, Even Ukraine & Crimea, & ALL OF THE MIDDLE EAST, & Africa, & Of Course, ALL OF Britain, well they were already THERE..After all, their “RULING ELTITES”..are ALL Perfectly Protected From THEIR OUTSIDE REAL WORLD..Europe & the US?? LEADERS, AKA..RULERS..RUSSIA? SAUDI? All Countries/Nations..where the transformation was NOT NEEDED, since THEIR ELITE Rulers, one of the Dictators, Tyrants, King or Queens, Socialists, Communists?..ALL had NO NEED..for the TRANSFORMATION..But there was Much WORK TO BE DONE..TO GET THE US TO just another one of those 3RD World Nations/Countries, As was the Rest of Europe that was Not again, Already…there..You think the RISE OF the 15 “named+ Groups of Terrorists”..was NOT allowed, assisted, & ALSO Planned & PAID? ?..Think again..if people would just do a Little “Research of their own”..But never look to the so-called MEDIA for the truths..none of it Exists..there..Only those trying to REALLY Report the Truths, are those having to do this by any & All “Other”..means necessary..& they have..but you Have to Search for it..it IS There..the Truths..they certainly DO NOT Want Any of US to know..that’s why so many try to share it, but mark my words, it’s already in the “workings” to Cut off more & more “WAYS” to get the REAL TRUTHS out..including f/book & any social media..after all..harder to control..for now..but NOT For Long..Merkel in Germany already has Zucker—g working on it..there & here..in the US.. There is a reason that Obama and the rest of his cronies are not impeached are 1. if you are old enough to remember the watt riots of the 60’s The R.King riots the Riots of Ferguson, Mo. and a slough of others. this country will be burnt to the ground and left in ruins. think about it the best way to put this piece of trash in prison for trial is the day he leaves office arrest the prick then and all of the ones who helped in his distruction of this country. GOD help us as HE is the ONLY HOPE left! If they want to help the world population we should start with them. It’s call ” The Process of Elimination” maybe we should start there first sooner than later. What do you think. REPLY. Yes!!! The time to rise up was yesterday! Fight the Terrorists in charge with their own medicine. Lone Wolves come in Patriotic American costumes also! We need to invade the Camps and destroy them. It is almost too late to organize a resistance. We lost one of our best patriots yesterday. Gen Norman Schwartzkof passed away. Where are our Senators and Congressmen? I call on all Vets., Retirees and Patriots to organize and get ready for a fight. Much of the ammo was sent to a place in N.Mexico and there are many places it could be stored. I believe that the FEMA Camps may be a great bet for the housing of the Immigrants, trespassers, ISIS whatever. Time for organized action is long past! These dems are the SCUM of the EARTH!! lying, cheating, killing babies and adults!!!! They should be in prison!!!!! Hay you forgot Obama as well. Democrat is code for liar. Time for the people in this Country to take a stand against the controlling, biased, disruptive factions in both parties who dictate who, what, where and when people will be heard, seen and acknowledged. The media jumps on the Trump and Clinton trains, because Trump says outrageous, not to mention, despicable things and Clinton has the Name and D.W.S. making sure no one else gets heard. The ignorance of the American public feeds and encourages his disgusting diatribes and support the D.N.C. chairman in her quest to squeeze out any other. viable, candidates by virtual gag order. If others can’t be heard nor seen, she’s a shoe-in!! Politics as usual, the people have no voice, they’re just led by the nose to the slaughter! If people are tired of this, they should fight for the rights guaranteed us by the Constitution, the Bill of Rights and the Declaration of Independence that released us from tyranny. If anyone thinks that our current state politics is not tyrannical, they are not paying attention! Trump is no better. Remember to ditch him too. I honestly believe Trump is the only honest one in the bunch. He is his own man, he owes nothing to anyone. Why do you think everyone in Washington hates him and are doing everything they can to stop him. Trump sees what is going on, Bernie, he is an idiot that is publicly pushing for socialism. Good luck with that. If you all want to be taken seriously then watch your spelling and your phrasing. It is great to hear all of this but you want to be taken seriously. Why doesn’t Trump or Cruz ask Hillary about the 4 houses she owns worth tens of millions , and how that happened when they were “Dead” broke when they left the white house???? The houses worth megabucks happened because they charged the government rent for providing “protection” for them to house their own Secret Service detail! She made a bunch out of that plus all they stole from the White House. These people are thieves and murderers. Remember Mena? I can’t imagine why anyone would be surprised by this–it has been obvious for some time, that Hillary is slotted to become the Democratic nominee. Debbie Washerwoman Schultz has been assigned to “make it so”. There’s not enough soap in the world to wipe Hillary’s record clean. Even though Sanders is far too left for most Democratic voters, they might just vote for him as a protest against having Hillary shoved down their throats by the DNC bosses. I TOLD YOU. There would be no more proof that the global elite “selected” our president, and not the people, if we wind up with a hillary/rubio ticket. They are the biggest scams since obama. Just another sign that our historical national Democrat Party of our grandfathers and fathers is truly DEAD. It has now become the party of amoral liberal socialists, who are anti-traditional marriage and pro-death/abortions and reject Christian morality and even God Himself. I suggest a living memorial for this dead political party in lieu of flowers, we vote only for “R”s before or after the candidate’s names. BLESSED BE THE MEMORY OF OUR NATIONAL DEMOCRAT PARTY! two scumbags why do anything different both lied theirwhole life. the one who wears pants even lied about GENDER. The Challengers in the DNC are just show boating . Hillary was locked in from the beginning , the people really never had a real choice like the Republican Party did . The DNC picked the 3 candidates against Hillary , the three worst candidates in their party . The Republican Party had at least 15 people running for President . The DNC stolen the people choice . since when has it become legal to rig elections? Was this a new presidential mandate? These morons are crazy and out of touch. Totally corrupt and willing to do anything to get elected……… the worst thing possible in this country is to have leaders with such low morals and ethics. Let’s beat these imbeciles in November…….. TRUMP 2016 !! Its obvious the Democratic party knows that Hillary can’t win on her record, or her own merit. What the DNC has done should be a criminal offense, and those involved should be punished. This group of corrupt individuals should be a total embarrassment to every decent Democrat registered to vote. Hopefully, they won’t vote for Hillary. There’s no telling how much danage she will do to this country if elected. I also hope that Bernie goes forward with his lawsuit and causes the DNC more damage than they can possibly imagine. We are in a tough situation. Trump can win the nomination but it is extremely doubtful that he could win the general election. The only one who polls well against Hillary is Rubio. The media is VERY negatively poised against Trump and the voter-bots will vote for whoever the media tells them to vote for. They are already ramping up her positive press (read puff pieces) in the liberal media. I saw a piece in the NYT yesterday that was extolling Hillary for “going undercover” to investigate racism in education–when she was a young law student. It is a bid to keep African-American voters who are slipping away from Hillary. They liked Bill–they do not like Hillary. The funny thing is, she thinks all of her obvious cheating is fooling anyone. It just shows more and more of the Real Hitlery she is,and she will bomb at the polls. I would like to remind every one that, this is why she lost to OBAMA, America tends to pick the “other guy”, when faced with having an obvious stinker take over, like ROMNEY lost. Hillary lost once, she will loose twice, especially when she shows up in a pull over potato sack, coke bottle glasses, dirty, sloppy hair in a pony tail. Would you expect anything else. Obummer demorats did the same and we just stood bye with their mid-digit pointed straight up. Learn about the Clintons in Roger Stone’s book “Clinton’s War on Women.” If BHO leaves office, she will be appointed as the next president. Count the electoral votes of the democratic states and add to them as many more that will be needed to be purchased with clinton foundation billions and george soros billions to put her in the oval office. leadership. Do you research this time and pick smart. Only GOD can help us! Our job is to pray for HIS HELP! Democrat voters are stuck with Hillary until she gives up or dies. The Clinton’s own the Democrat party and they are going to do all they can to make sure it works for them. I find it hard to believe that two aging liberals are the best the Democrats has to offer. Maybe the concern among rank and file Democrats should be if the party has a future after the Clinton era finally ends? In Kentucky, Democrat politicians are becoming more of an endangered species as voters show their disgust with the national party by electing Republicans. 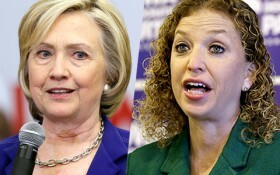 If Hillary loses in a landslide in 2016, maybe the Democrat party will clean house and send their crazy, extremist leaders, like Debbie Schultz, Harry Reid, and Nancy Pelosi, into retirement. Only GOD can do what you hope shoud be done Let us pray for HIM to ehlp us this election! If we don’t pray fervently, we can not expect HIM to help us! Bill has potential to do something good if H was not a variable. Not as much as others. I Think he is not good either. Just H is dangerous. H is arrogant. Define Communism. A political system in which the state has complete control of the sources of wealth, land and factories, and in which there is NO private property and NO difference in social classes. Define Hilary Clinton: A person who lies like hell and is a member of the communist party. Two more members of that same party—Obama and Bill Clinton and all Dem o rats. It was you who mocked the Bible and Jesus Christ’s Sermon On The Mount while repeatedly referring to the ‘HOLY ‘ Qur’an. PRESIDENT HUSSEIN…. It was you who traveled the Islamic world denigrating the United States Of America. This no story. DNC caught doing SOMETHING ETHICAL!!! That’s a story!!!! Carson for republican. Sanders for democrat. Want best choices. If we don’t pray to GOD for HIS HELP we are doomed to get what the devil wants! SCHULTZ IS AN CRUDE INSULT TO DEMO PARTY….HEARD HER RAVES ON TRUMP…..NO ONE GOOD WORD FOR THE MAN WHO WILL BE PRESIDENT AND DESERVES IT……………….IT’S A DISCUSTING SHAME THAT DEBBIE LIVES HERE IN S. FL. In the Democratic party it’s business as usual involving two of the most dishonest Democrats running things. Wasserman-Schultz and Hillary Clinton top the list. When Bill Clinton starts campaigning for Hilary, the Democrats will have the top 3 phonies in the party. Keeping ‘The Butcher of Benghazi away from the debates will lessen her chance of screwing up, or even worse, answering probing questions. In the last debate, when asked if HER policies and decisions regarding Libya had an adverse or negative effects, she refused to answer, but merely danced around the question. It should be interesting in the Presidential debates when she is on the ‘pressure cooker’ to give somewhat difinifitive answers. Will she be able to hold up???? I suspect her reply will be “That’s already been covered” just like slick Willy. Our HOLY FATHER GOD, the ALMIGHTY, thank YOU for helping us to vote in the person YOU want to be President in JESUS’ NAME! MARANATHA! AMEN! Hillary should be in prison by now and facing charges of treason and lying under oath! Wake up America……….If the Dem’s get back in the White House, God Help America!!!!!!!! Donald Trump for America………….. The Democrats also rigged Obama’s. Someone needs to go to jail over this corruption. Unless someone goes to jail, this kind of corruption will never end. This is wrong and I hope it’s stopped. I’m SHOCKED! SHOCKED! I tell you. Should do the right thing and just drop out. This great country that we live in has already been heading in the wrong direction. We already know she has no problem lying to the American people. I can’t think of a single thing that she might do to help this country. Obama is a Muslim but will never admit it . If Obama admitted it he would have to resign the presidency because we can’t have a Muslim for president.